Note from editor: please visit this page https://www.facebook.com/BloodLionsOfficial, before considering any walking with lions tour and learn more about lions breading industry in South Africa. [link removed by editor] lies half an hour outside of Pretoria in South Africa. It is a beautiful, secluded and enchanting animal sanctuary. 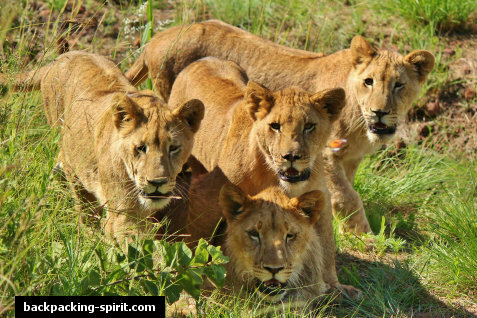 In March 2012, I had the pleasure of meeting the owners, the MacRae family, who specialize in wildlife conservation and run a lion breeding and rehabilitation program. Part of the rehabilitation program is to ensure that the lions are walked before they are fed, thus teaching them the connection between movement and food. 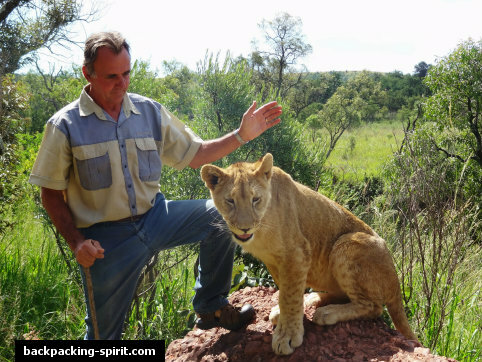 Colin, the owner, had advised us not to approach the lions, and to let them approach you; he explained that this is how you gain respect. One by one, the lions bounded over to us, smelt us and rubbed their nose across our skin. 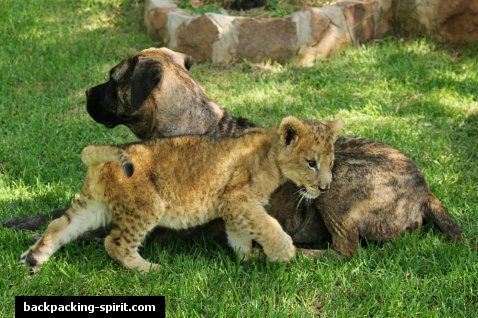 They were boisterous, playful cubs, and, amazingly, the owner’s dog came with us on this walk and joined in with the playing lions. We enjoyed a half hour walk with the cubs to their favorite watering hole; when they got there, they swam, played and drank, and then, tired from the midday African sun, they fell back upon the long, emerald green grass and dozed off. When our walk was over, we were also given the opportunity to meet some of the younger lions. There was a three month old cub who we were given the opportunity to feed. 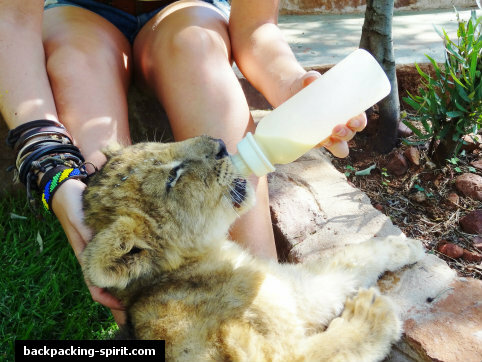 I was given a milk bottle and the cub bounded over to me, sat happily at my feet and suckled the milk down within seconds! We also met two beautiful new born cubs, who were so small they could fit in the palm of your hand. It was certainly hard to believe that such small creatures could grow so large! We finished the day by visiting the fully grown adults who were kept in spacious grounds at the back of the complex. There were two beautiful males – one with an incredibly spectacular black mane. One of the men in our group dared to get close to the fence and take a picture. The lion emitted a low growl, and the man, in surprise, literally toppled backwards and dropped his SLR camera….! It was a quiet reminder that whilst these beautiful animals were spectacular to observe, you should always give them the respect they deserved. 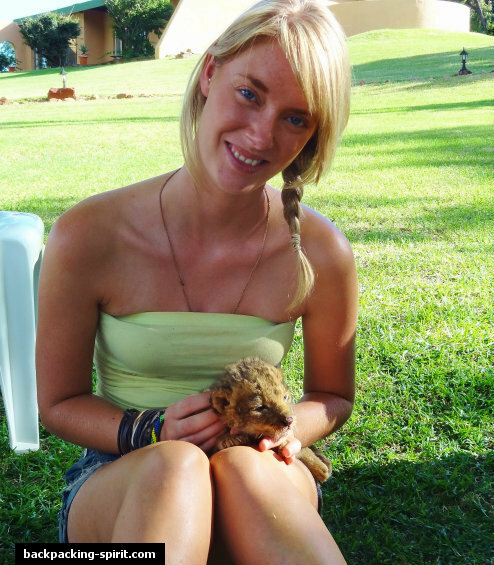 About the Author: Emma Spires is a backpacker with a serious case of itchy feet! Her first trip was a solo adventure at aged 17 to Ghana, West Africa, to participate in a Volunteering project. Nine years later, she has covered every continent in the world, but still has not cured those itchy feet! Check out her website Backpacking Spirit for some awesome travel tips, advice and inspiration; you can also follow Emma’s travel adventures Backpacking Spirit Blog! 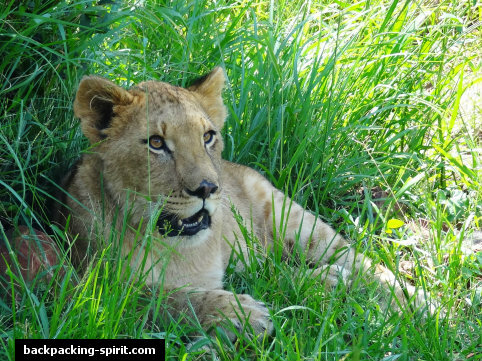 Hi Emma, Like most you are led to believe this amazing experience is just.. please take a look at the above link.. Education on what is REALLY happening to the Cubs you walk with. It is a cruel industry we are trying to STOP to save our Lions. Many thanks. 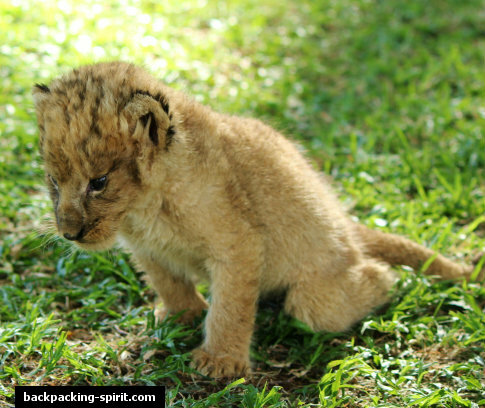 In regards to your experience with cub petting and lion walking, I wish you would have done research first about these two tourist industries prior to paying to participate in them. Lion walking and cub petting are NOT conservation, in fact, the lion walking activity you participated in contributes nothing to conservation; those lions are not being rehabiliated and I can assure you that the money paid by tourists to pet and/or walk with lions _ lion cubs does not amount to enough to pay for all of their care. In fact, lion walking has been proven to have adverse effects on conservation; no lion has ever been released into the wild after growing up in captivity, and thus any facility that offers lion walking is NOT conservation or rehabiliation, it is simply exploitation for tourist money. Many tourists and volunteers refuse to believe this, because they cannot come to terms with the fact that they paid to participate in a pro-cruelty industry, hence furthering the industry. I advise you to do some serious research on cub petting & lion walking and see just exactly what you paid into during your time spent with this “rehabiliated” lions. Please, don’t spread the message about lion walking being “conservation.” Did you know that 1000 lions are killed every year in Africa in hunts? And these lions that are killed are the same ones which you walked with, and cuddled. They are raised for petting & walking for money, then are killed in hunts. Just reviewed your place an I am awed that you allow this to happen. You are putting people an lions in danger. A lion is a dangerous wild animal an could turn on these people at any time. What happens then kill the lion? Use some common sense an don’t endanger either one.